Polyvance's 6085-C Nitro Fuzer Welding System is the most advanced nitrogen plastic welding equipment available. It comes with everything you need to get productive right away doing the fastest, strongest plastic repairs on virtually any type of plastic. Welding with nitrogen gas creates the strongest welds possible because it eliminates oxidation of the plastic during the welding process. The Nitro Fuzer welder combines hot air and nitrogen welding capabilities for maximum versatility. The 6085-C welder features digital encoders to precisely control the temperature of the nitrogen and airless welders. It also automatically switches from air to nitrogen when the torch is removed from the holster and automatically switches back to air when the torch is placed back into the holster. Precision regulators combined with a flow gauge gives you the ultimate control over how much gas is used in the welding process. The 6085-C Nitro Fuzer also features an integrated airless welding system for smoothing out welds and for repairing thermoset polyurethane. 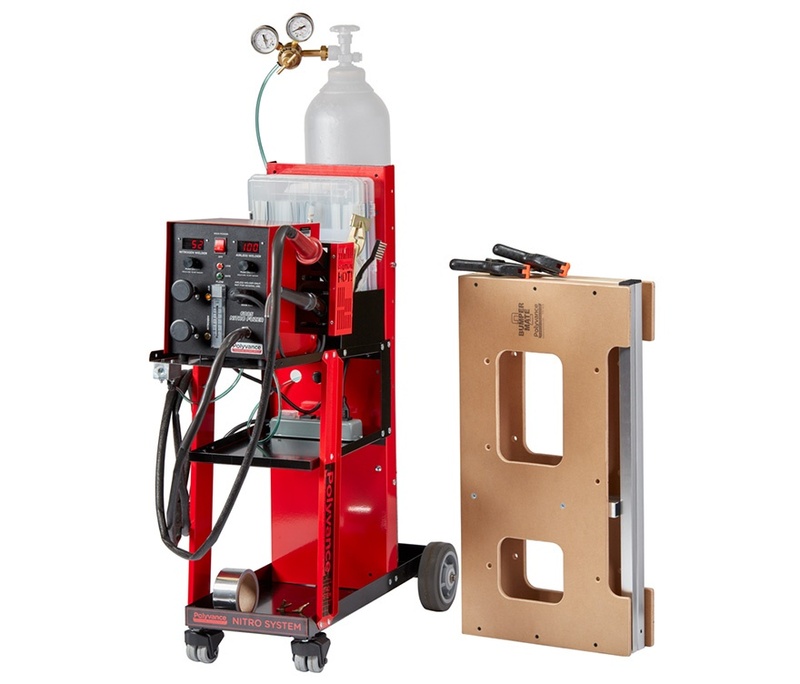 The 6085-C Nitro Fuzer Welding System comes completely assembled and ready to go. It is packaged with three Welding Rod Organizer Cases filled with a large selection of welding rods, a hand seamer, aluminum tape, and the Bumper Mate 2 Workstation. Easy-to-operate, digitally encoded temperature controls. Holster switch provides automatic air to nitrogen switching. Remove the torch from the holster and you are using nitrogen. Replace the torch into the holster and now it is on air. Outlet pressure gauges for both air and nitrogen. Ease: Repairs are simple to do. Your techs already have the skill set; with the 6085-C Nitrogen Welding System, they have the tools. Create Loyal Customers: 25% of a shop’s business is customer-pay. Save customers money on small hits and they will return to your shop with the big hits. "We are very happy with the welder and use it just about every day. Over the past nine months since we bought it, we've saved a few cars from being totaled."